In early December 1880, Thomas Nevin was dismissed from the position of “Keeper” at the Hobart Town Hall for inebriation while on duty. The Mayor’s Committee expressed deep regret at the dismissal (reported in The Mercury December-January 1880-1881), and mindful of his growing family, the Council decided to retain his photographic services. He was re-assigned to civil service with warrant and photographic duties as assistant bailiff with The Municipal Police Office, located at the Hobart Town Hall. 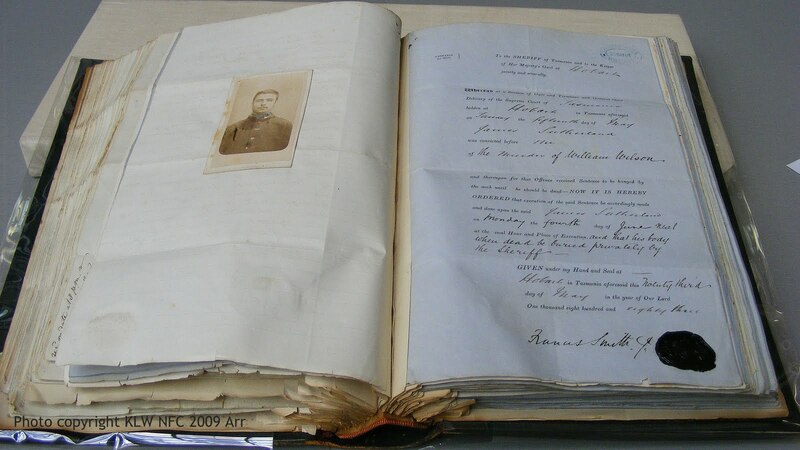 Working principally in the City Police Court and Hobart Supreme Court as assistant to Sub-Inspector John Dorset(t), Nevin continued to provide identification photographs of prisoners up until 1889, a service he had provided for the Prisons Department and MPO since 1872. Many of these mugshots were collated with the Municipal Police Office issued warrants; two death warrants with Nevin’s photographs of the condemned man attached (e.g. Sutherland 1883; Stock 1884) now survive intact in the Mitchell Collection at the State Library of NSW. Death Warrants V.D.L (Tasmania, Supreme Court C203). Above: Nevin’s hand-coloured carte-de-visite of prisoner James Sutherland in prison uniform, collated with Sutherland’s death warrant, May 1883 (Mitchell Library C203). 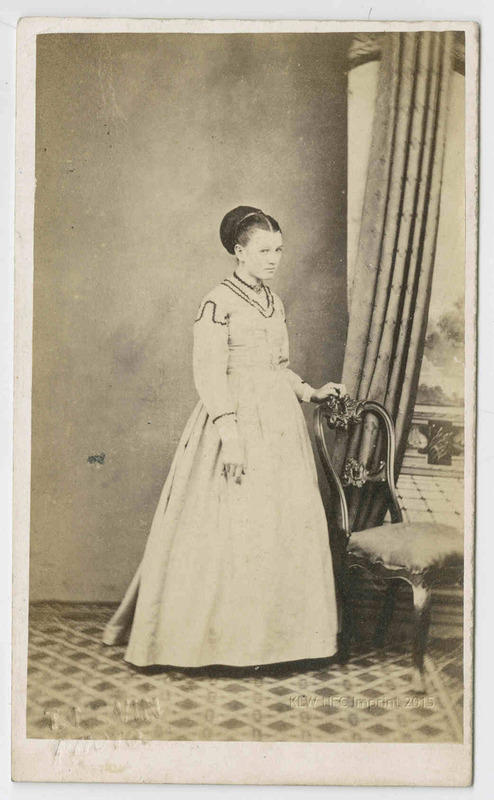 Below:This photograph also by T.J. Nevin was the “booking photograph” of Sutherland taken on arrest (NLA Collection). He called John Dorset, who stated that he employed defendant occasionally as an assistant bailiff. 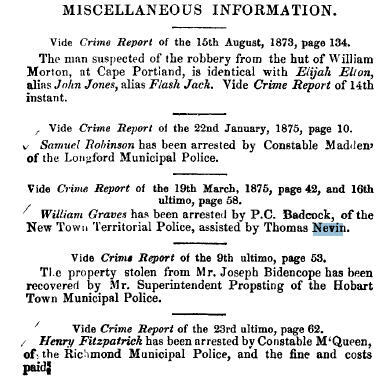 On July 26, 1886, Inspector John Dorset(t) of the Hobart Town Municipal Police visited Nevin’s house with a request for his services. 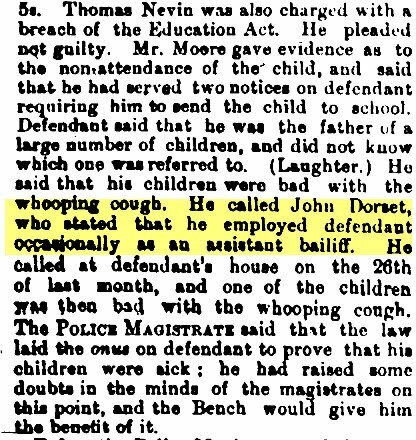 Dorset found a child in bed with the whooping cough, and two weeks later gave testimony to the City Police Court of the situation when Nevin was charged with a Breach of the Education Act by schools truancy inspector Mr Moore for not sending his child to school. Because of Inspector John Dorset’s testimony, the charge against Nevin was dropped. How many is a “large number of children“? 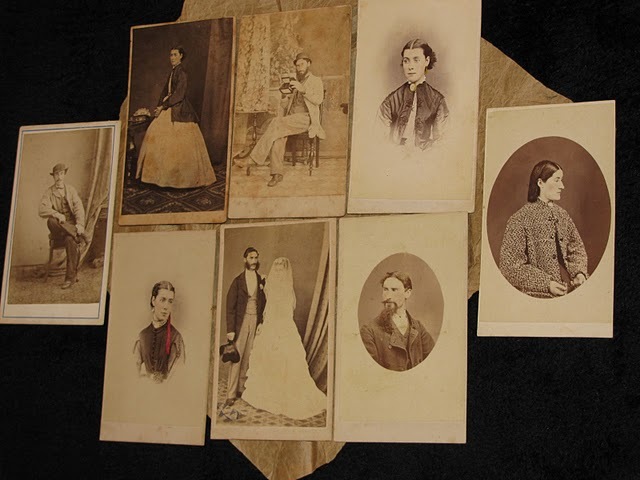 Thomas and Elizabeth Nevin were parents of five living children by 1886: Mary (May) born 1872; Thomas (Sonny) born 1874; Sydney born 1876, died 1877; William John born 1878; George born 1880; Mary Ann born 1884. 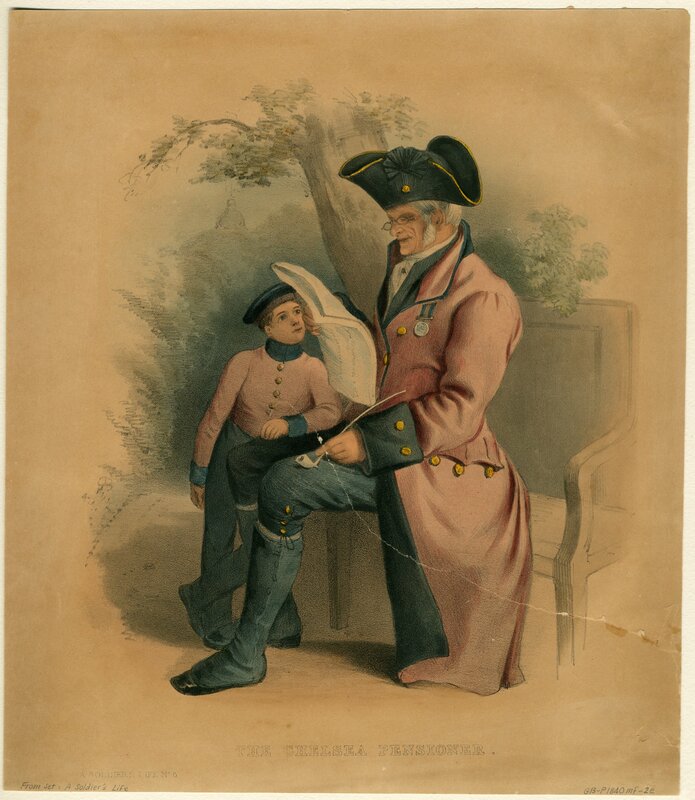 In all probability, it was either William or George who was reported as not attending school. 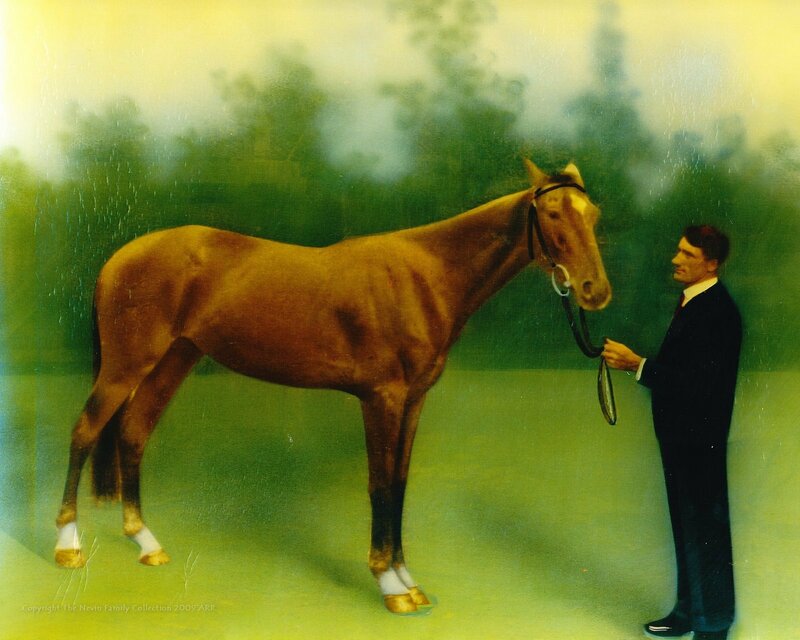 The last child Albert was not yet born: he arrived in 1888, and fathered eight children. Thomas Nevin was also charged [ie in addition to other parents for the same breach] with a breach of the Education Act. He pleaded not guilty. Mr Moore gave evidence as to the non-attendance of the child, and said that he had served two notices on defendant requiring him to send the child to school. Defendant said that he was the father of a large number of children, and did not know which one was referred to. (Laughter). He said that his children were bad with the whooping cough. He called John Dorset [sic], who stated that he employed defendant occasionally as an assistant bailiff. He called at defendant’s house on the 26th of last month, and one of the children was then bad with the whooping cough. The POLICE MAGISTRATE said that the law laid the onus [italics] on defendant to prove that his children were sick; he had raised some doubts in the minds of the magistrates on this point, and the Bench would give him the benefit of it. Click on: The Mercury 11 August 1886. Superintendent Nichols, 27 March 1874. Nevin also photographed prisoners again during their incarceration (assisted at the Hobart Gaol, Campbell Street, by his brother Constable W.J. (Jack or John) Nevin, and whenever the prisoner was released or discharged. On any one of these occasions Nevin made duplicates of the one image for circulation to police in Tasmania and if requested, in other Australian States. 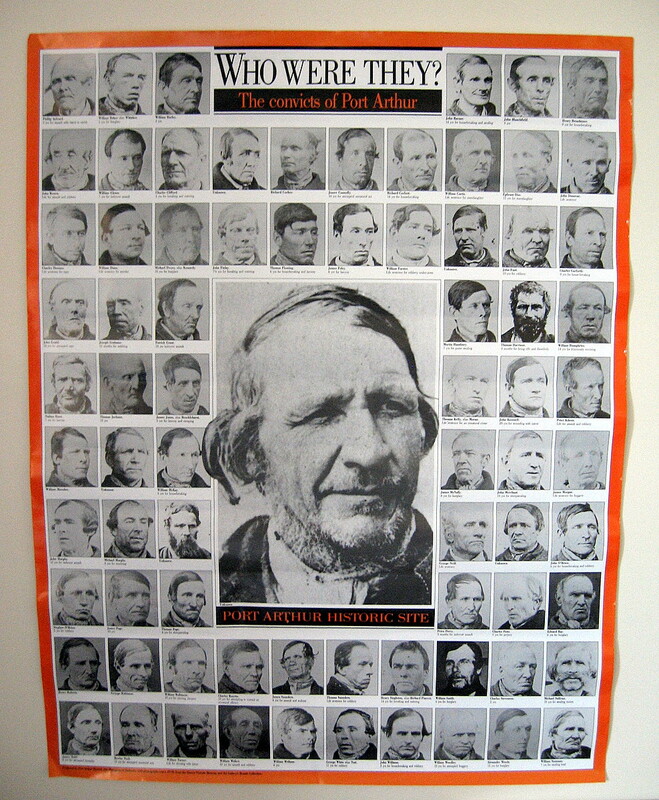 Thomas Nevin’s photographic techniques applied to the production of prisoner mugshots for police and prison authorities changed over the years. 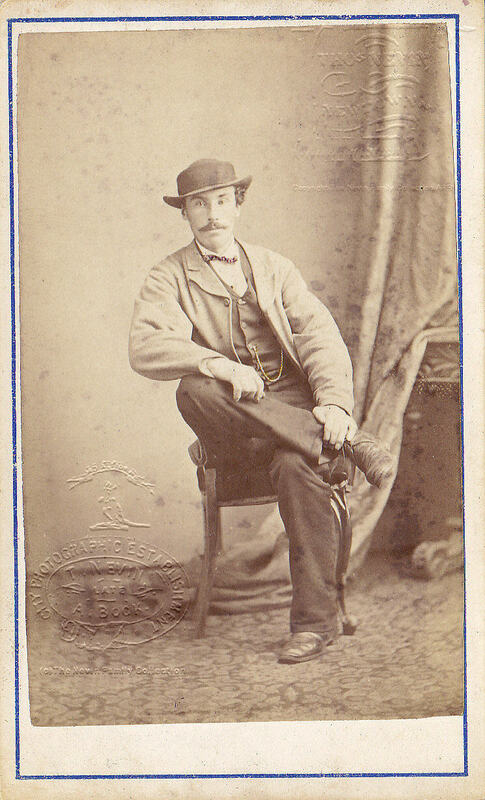 In the early to mid-1870s, his practice was commercial and his techniques reflected the usual studio portraiture methods of the era. 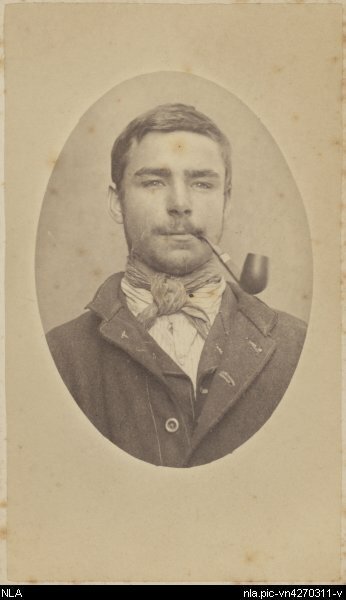 By the early 1880s, cognizant of prison photography techniques deployed elsewhere in Australia, in Europe and in America to show full-frontal and profile characteristics of the prisoner, his photographs conformed to prison requirements. 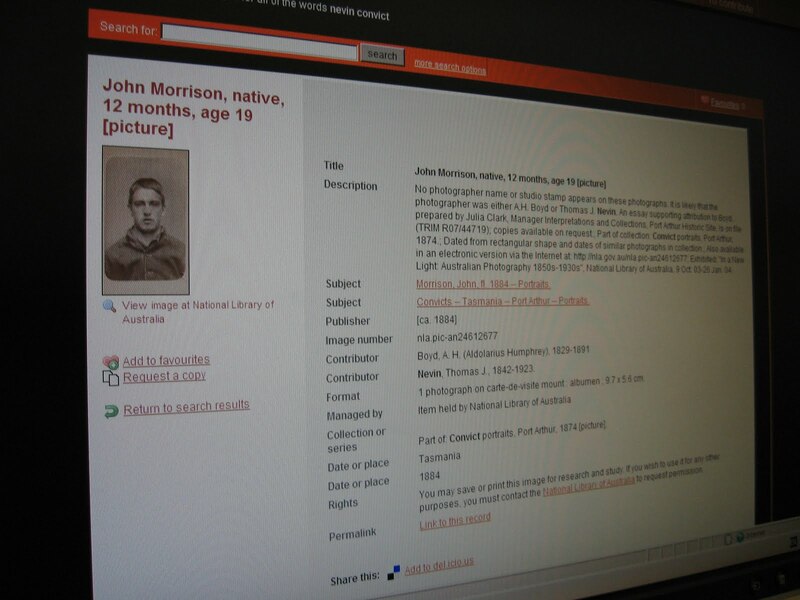 This is one example, of a young prisoner who was originally named as John Morrison in the National Library of Australia’s catalogue, eg. for the NLA exhibition “In a New Light: Australian Photography 1850s-1930s”, 9 Oct. 03-26 Jan. 2004, and renamed as John Norman in 2013. Boyd, A. H. (Aldolarius [sic]Humphrey), 1829-1891. Dated from rectangular shape and dates of similar photographs in collection. 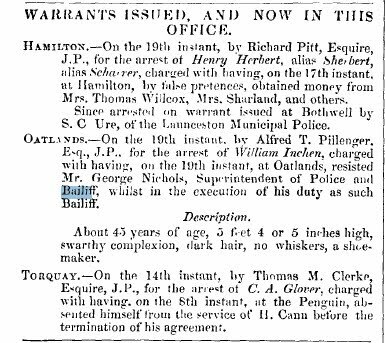 Sentenced of 12 months on 5 February 1884. Also available in an electronic version via the Internet at: http:/​/​nla.gov.au/​nla.pic-an24612677. 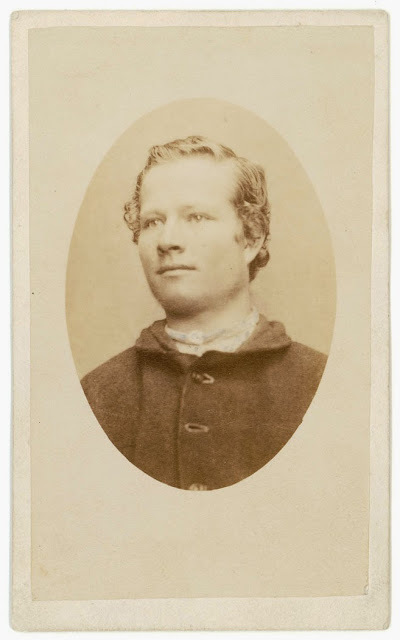 This young locally-born (“native”) 19 year old John Morrison or John Norman was photographed on being received at the Hobart Gaol on February 16, 1884 by Constable John Nevin. 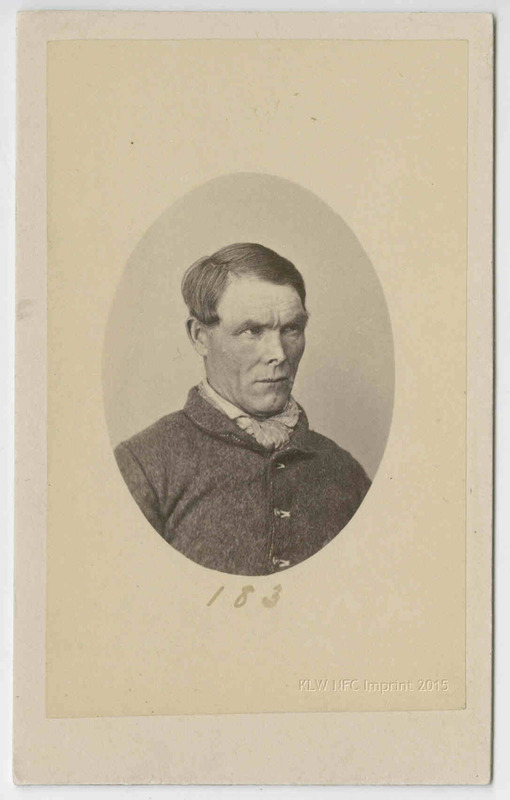 The National Library has included the photograph among the collection of the earlier 1874 convict photographs taken by Thomas J. Nevin, and retained the prison location as Port Arthur despite the simple fact that in 1874 the prisoner would have been only 9 years old, and clearly he is not a child in his photograph. As for the place of imprisonment, he could not have been imprisoned to serve his 12 month sentence at the Port Arthur prison because it was well and truly closed by 1877, and by 1884 it was in ruins. Not simply content with misleading the public with this sort of catalogue entry, the NLA has compromised Thomas J. Nevin’s former sole attribution ( from accession in the 1980s until 2007) for this collection of Tasmanian prisoner mugshots with a parasitic misattribution to the non-photographer and retired Port Arthur prison official A. H. Boyd, the result of deliberate falsification by individuals (eg Julia Clark) seeking appropriation and self-promotion. 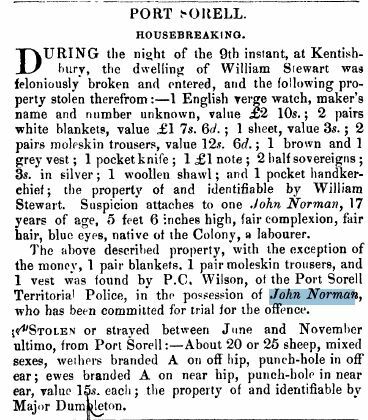 Click on the second image below or visit the NLA catalogue full records of the “Port Arthur convicts 1874” collection to examine this egregious mismanagement of the national heritage since 2007 by the National Library of Australia.